Swedish designer Love Hultén is freaking obsessed with classic arcade games. 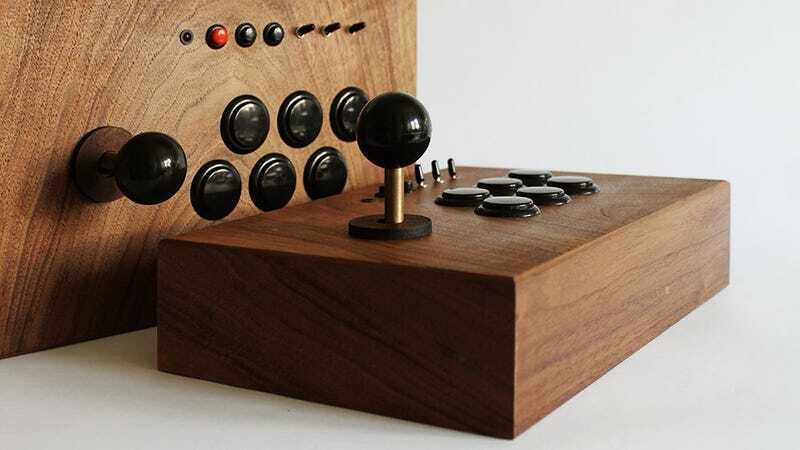 You'd have to be, to craft a beautiful wooden console with matching controllers just to house a massive collection of them. Awesome. At first, Hultén's R Kaid-42 ("arcade for two", get it?) looks like an old, hand-crafted box. It's made of dark walnut with brass fittings, and measures about 7 x 7 x 14 inches, which is considerably smaller than even the tiniest mini-fridge. But the box, which is held together by magnets, magically breaks apart from this compact package into a console with two controllers. Some basic assembly is required. The controllers are wireless with rechargeable batteries. They're big and beefy, just like you want them to be. Beneath the wooden exterior, the R Kaid-42's console box is a small 1.8 GHz PC that instantly boots to a homegrown interface that lets you pick between some 20,000 classic titles (see the video below). The console has VGA connectivity so you can connect a display of your own—none is included with the R Kaid-42. You, too, can have a beautiful arcade like this one. Pricing starts at about $1000, but Hultén doesn't specify a final price for the package, saying each unit is a custom job that will be tailored to each customer's needs. No matter what, it'll cost you more than a quarter.